I'm Jason Neuswanger, known as "Troutnut" to my fishing buddies. This page answers some peoples' questions about my background and how Troutnut.com came about. My scientific career is best described on my academic website, but here's a quick summary. In August 2014 I received my Ph.D. in biology (specializing in trout & salmon ecology) at the University of Alaska Fairbanks. I studied the feeding behavior and population dynamics of juvenile Chinook salmon in the Chena River in central Alaska. You can read a basic summary of my dissertation on this site or view the whole thing as a PDF. Immediately after finishing my Ph.D. work, I started a post-doctoral research position, remotely collaborating on an Alaska-based project with Dr. Gary Grossman at the University of Georgia. We're working to better understand the mechanisms that control the behavior and feeding success of drift-feeding fish, using juvenile Chinook salmon, dwarf dolly varden, and Arctic grayling for our case study. I started fly fishing in July of 2003 after a brief stint as an avid worm dunker left me fascinated with trout but annoyed with my methods. I had received a fly rod the previous Christmas and I liked the prospect of catching trout without carrying several cups of easily overheated leaf worms in my fishing vest. I borrowed a copy of Ernest Schwiebert's encyclopedic 2-volume Trout from a friend and read much of it. I learned to cast through his fluid prose, and I read about the excitement of hatch-matching, though I was not yet ready to apply it. I vividly remember my first trout on the fly. It was a muggy July afternoon and I was hoping for a blizzard hatch of "White Flies," whatever those were (Ephoron mayflies, it turns out). I had just bought some dry flies at a local sport shop, but I didn't really know what was what. My first trout on the fly, a respectable 14-inch brown. Toward dusk some very large mayflies started bobbing and weaving over the water. I did not yet know an emergence from a spinner flight from a spinner fall, but I tied on a scruffy Hexagenia limbata dun imitation and started flailing it around. I had trouble keeping it afloat on the riffly water, and one especially turbulent current tongue swallowed my fly. I strained my eyes to see it but I gave up. Yet when I pulled up for the next cast, it did not come! My rod bent and I felt a fish tugging. I dared not assume it was a wily trout, and I contained my excitement until I was sure I was not connected to a snagged redhorse. 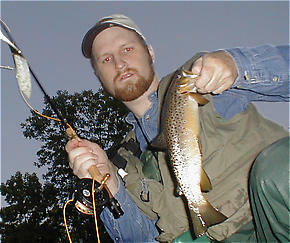 A respectable 14-inch brown trout found its way into my net and was photographed and released. I later learned that the large mayfly spinners were Hexagenia atrocaudata, a sparse and rarely fishable hatch, and I doubt my catch had anything to do with them. But it did a lot for me. I started tying flies in early November that year, and I grew frustrated with the limited color plates in the many excellent books on stream insects that I had by then collected. I needed to see the real thing, so I borrowed a kick net and started collecting insects from my streams. I quickly learned that any insect preserved in a vial of chemicals is a poor representative of the vibrant living thing. A better method of preservation was photography, and I started to photograph the insects I collected. The familiar face of Troutnut.com through most of the first two years of its existence. I posted some of the pictures on online forums and the reaction was very positive. I needed a way to store and organize them anyway, and since I had much experience working as a web programmer (the ultimate high school job for a computer geek in the 90s) the natural choice was to create a website. 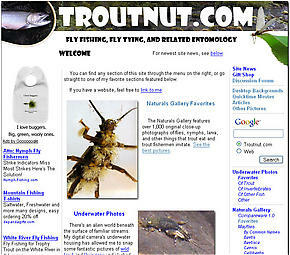 Troutnut.com went online in February of 2004. Here�s a tip for anyone working on an angling entomology � never ask yourself before, during, or after if it�s worth it. Never let the slightest hint of sanity taint the compulsion that is the foundation of such a pursuit. We need not ask ourselves if it's worth it, because the answer is always yes. I was born in 1980 in the northeastern Missouri, way too far from any trout streams. Because my father is a fishery biologist, I started fishing at the age of 2 or so, and I was obsessed with it. 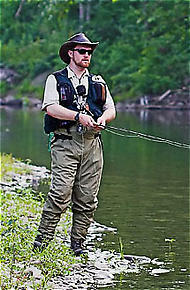 The Troutnut fishing a Catskill tailwater. From age 10-12 I spent (Spent: The wing position of many aquatic insects when they fall on the water after mating. The wings of both sides lay flat on the water. The word may be used to describe insects with their wings in that position, as well as the position itself.) much of my time poking around a couple of very small streams within bicycle or walking range of my house in the woods. They were too warm and intermittent to hold trout, but many minnows lived there and I learned their taxonomy and sought every local species for my aquarium like a collector. My dad showed me what caddisflies were at one point, but I never became really interested in invertebrates at the time. In 8th grade I saw Carl Sagan's Cosmos video series and read A Brief History of Time by Stephen Hawking. Those things set me down the path toward a career in astrophysics and I ended up at Cornell University's astronomy program as an undergraduate. After a few years I realized I wouldn't enjoy the day-to-day work in that field, as fun as it was to read about astronomers' results in the news. So I took some time off. Around that time my parents moved from Missouri to northwest Wisconsin, to evergreen forests laced with fertile trout streams. I spent (Spent: The wing position of many aquatic insects when they fall on the water after mating. The wings of both sides lay flat on the water. The word may be used to describe insects with their wings in that position, as well as the position itself.) a year and a half back there, during which I developed the initial version of this website. I also learned how my knack for applied math and computer programming could be applied to quantitative fisheries science, so I returned to Cornell and finished my degree as a mathematics major. Some fascinating classes on mathematical and behavioral ecology drew me into a corner of fishery science that led straight to a Ph.D. program in beautiful Alaska. Here's a link to Jason Neuswanger's Google profile for the search engines. Schwiebert, Ernest G. 1978. Trout. E.P. Dutton.